NAMHO records show that this organisation had not paid the annual subscription to NAMHO when last checked. If you know that the subscription has been paid, please contact the webmaster to have this message removed. Checks will be made periodically to establish whether subscriptions have been paid. Area of interest: Museum of the English Coalfields. Opening times: Seven days a week from 10:00am to 5:00pm. Closed December 24, 25, 26 and January 1. Educational facilities: Contact Education Officer. Purpose built education centre. Archive collection: Contact museum in advance of visit. Artefact collection: Contact museum in advance of visit. Current projects:	 The Hope Pit complex was opened in 2005. The site is now packed with interactive displays and multimedia science exhibits that demonstrate the science of coal mining. The opening times of Hope Pit vary and some exhibits may only be available at certain times. Please contact the Museum Reception for details. How to get there: By Road: On the A642 halfway between Wakefield and Huddersfield. Easy access from both Ml and M62. Follow brown heritage signs. By Rail: Nearest Main Line Station is Wakefield Westgate with direct services to London. By Bus: Bus services run within walking distance of the museum. Additional Information: The museum opened in 1988 as the Overton, Wakefield, Yorkshire Mining Museum. Last updated: 30/10/2017	 The guided underground visit takes about 1 hour to complete. 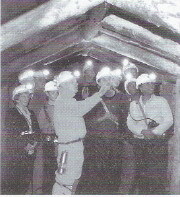 A tour through the authentic working illustrates a variety of mining conditions from the early days to the present. Warm clothes and sensible shoes should be worn. The surface exhibits include a steam winding engine, various mining machinery and extensive displays to illustrate technical, historical and social aspects of mining. The facilities include a nature trail, adventure area, picnic area, shire horses and pit ponies. In addition an extensive gift shop, the Miners Pantry offers a range of meals from a Sunday roast to snacks.